News traders huddle up! 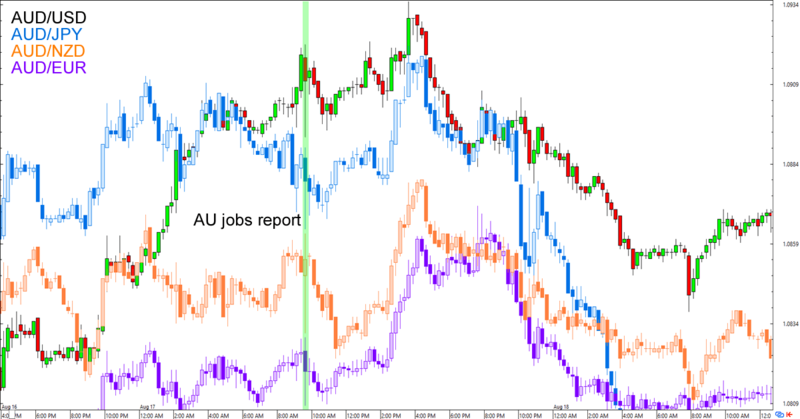 On Thursday (September 14) at 1:30 am GMT, the Australian Bureau of Statistics (ABS) will publish Australia’s labour market numbers for the month of August. Australian Bureau of Statistics’ trend estimates saw a net of 27,900 workers finding jobs in July. This is higher than the expected 20,000 increase and upwardly revised 20,000 net jobs added in June. Unemployment rate was also pretty good at 5.6% after June’s rate was revised higher to 5.7%. The devil is in the details though. See, the gains were mostly from the 48,200-increase in part-time jobs that were weighed down by a 20,300-decrease in full-time employment. This is probably why the average monthly hours worked in all jobs also took a 0.8% hit for the month. And then there’s the participation rate – which measures workers looking for jobs against the overall labour market –inching higher to 65.1% when analysts had expected it to remain at 65.0%. Last but not the least is the 1,000-decrease in unemployment, which reflects 3,800 fewer looking for full-time work and an additional 4,900 workers looking for part-time jobs. The grim details – published a day after a weak quarterly wage growth report – failed to rally the bulls. The Aussie fell at the first hour of the release before risk appetite in the next trading sessions pushed it higher against its counterparts. Traders estimate that Australia will add a net of 20,000 jobs for the month of August while unemployment rate is expected to remain at 5.6%. First, ANZ job advertisements rose for a sixth straight month in August. It’s up by 2.0% for the month and is 13.3% higher from a year earlier. Meanwhile, Australian Industry Group (AIG)’s Performance of Manufacturing Index (PMI) clocked in its 11th consecutive uptick, this time increasing by 3.8 points to 59.8 – the highest since 2002 –in August. The employment component dipped by a point, though the wages sub-index popped up by 3.3 points. Unlike the PMI, AIG’s Performance of Construction Index (PCI) slipped by 5.2 points to 55.3 after hitting a record high of 60.5 in July. Even the employment component missed with a 7.5-point slide to 51.5 after rising to 59.0 in the previous month. The silver lining is the wages sub-index rising by 0.7 points to 65.3, the fastest since August 2016. Last but not the least is AIG’s Performance of Services Index (PSI), which also saw a more moderate growth. It fell by 3.4 points to 53.0 with the employment component taking a 4.4-point hit to 52.5. Fortunately, the wages sub-index rose by 2.6 points to 57.7, indicating upward wage pressure relative to the previous months. Based on the reports above and after seeing pretty strong numbers in July, it looks like traders have a right to expect fewer jobs created in August. True enough, both the NAB and AIG’s indices indicate upward wage pressures even as their employment indices took a few steps back. Still, with part-time employment eclipsing gains in full-time jobs and dragging on average hours worked, it probably won’t take long before wage growth loses its momentum. In any case, make sure you keep your eyes peeled not only on the headline numbers but also the details when the report is published on Thursday!